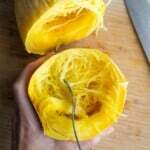 Showing you how to cook spaghetti squash- the EASY way! Roast it whole, so you can avoid cutting through a rock hard spaghetti squash, or mangling your hand while scooping the seeds out. Spaghetti squash. Love eating it, hate cutting it. And scooping it. And how it can end up soggy sometimes. 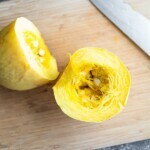 Well, today I’m sharing my method for how to cook spaghetti squash whole, and let me tell you, it is the EASIEST way to do it, and you end up with perfectly cooked (non soggy) spaghetti squash noodles! 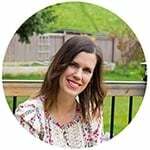 A few months ago, I shared my method for cooking a whole spaghetti squash in the Instant Pot, so it should come as no surprise it’s my go-to method for oven cooked spaghetti squash as well! 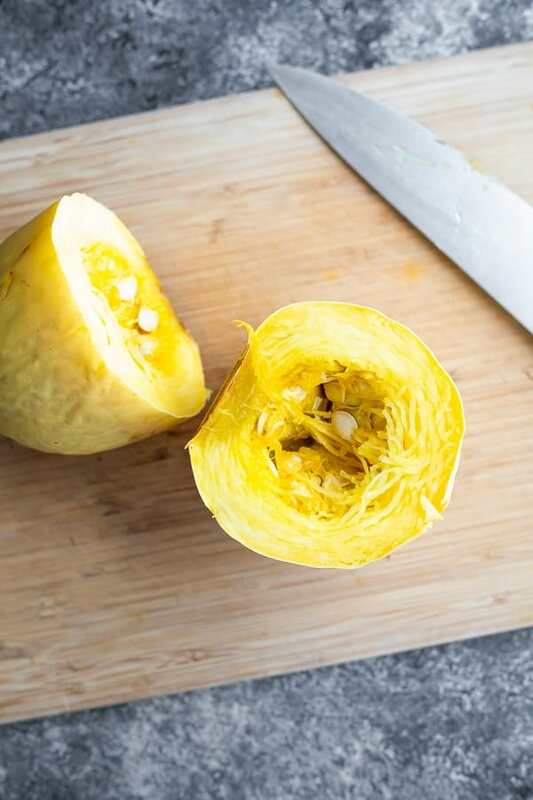 By cooking your spaghetti squash whole, you avoid cutting through a rock hard spaghetti squash, and it’s so much easier to scoop out the seeds once it’s cooked, too! Not only that, but you avoid over-steamed, mushy spaghetti squash noodles. They are perfectly cooked, not mushy but tender and with the perfect amount of bite to them. 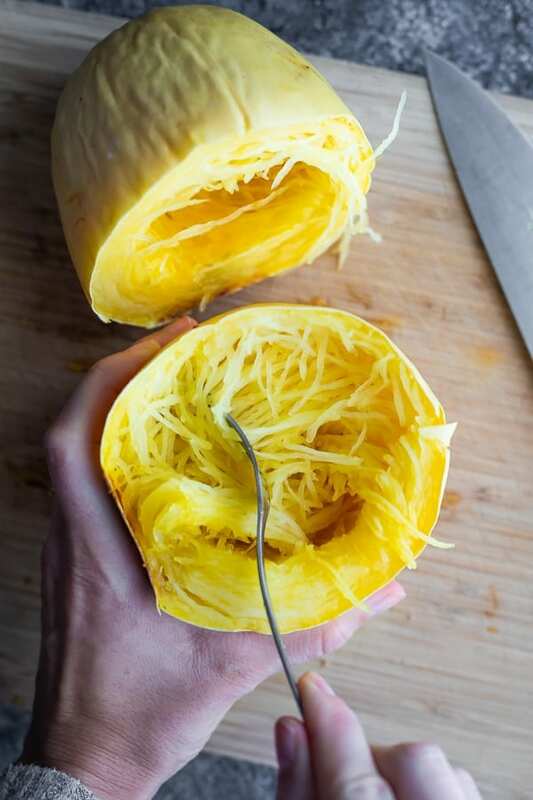 your spaghetti squash noodles end up perfectly cooked, and if you cut it the right way, you’ll get nice, long noodles! 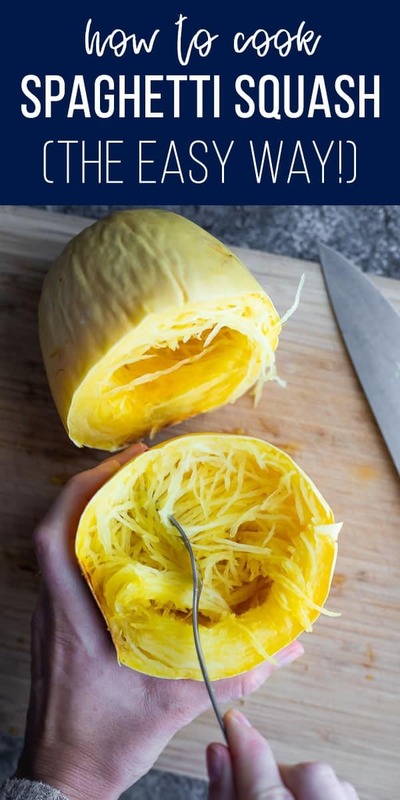 You will find a million tutorials for how to cook a spaghetti squash, and most of them involve cutting the squash in half lengthwise, scooping the seeds out, and baking in a dish with some water. This is how I used to cook my spaghetti squash, and it worked fine. But I hated cutting the raw squash in half (even with a good chef’s knife I found this difficult and dangerous to do), and my noodles ended up short (because I was cutting the noodles in half by cutting the squash in half lengthwise). work the noodles out from the squash and voila! You are done! What temperature do I use for cooking spaghetti squash in oven? I recommend 350°F. How long to cook spaghetti squash in the oven? This is going to depend on the size of your spaghetti squash. The average spaghetti squash that I purchase from the grocery store are just over 2 lbs and they take me just over an hour to cook. How can you tell when your spaghetti squash is done? I use a paring knife and sink it into the top of the squash. If you feel resistance, it is not ready. If it sinks in easily, it is ready to come out. 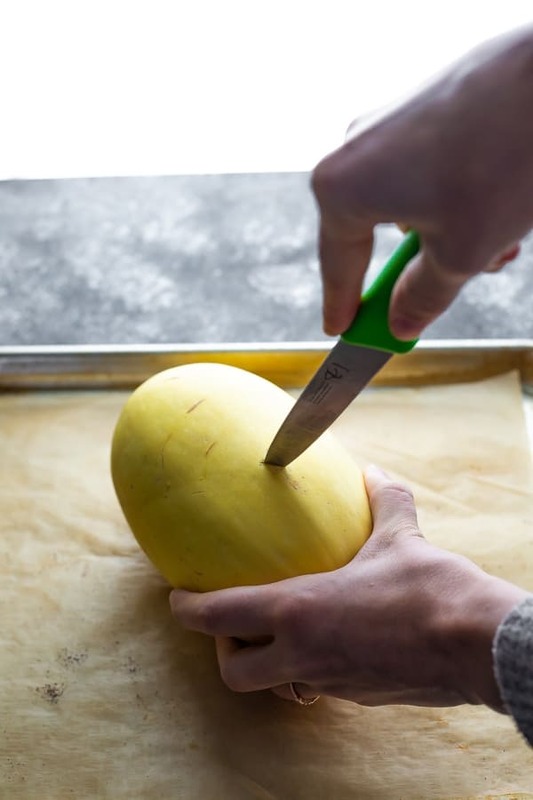 How do you cut a spaghetti squash? Once your squash has cooled slightly, cut it in half in the middle of the squash (as pictured above). Because the ‘noodles’ wrap around the inside of the squash, if you cut it into two ‘boats’, you are cutting the strands in half, and you’ll just get short noodles. Cutting in the middle will give you nice, long noodles. How long does spaghetti squash keep for? In the pantry (pre-cooking), a LONG time! Months. 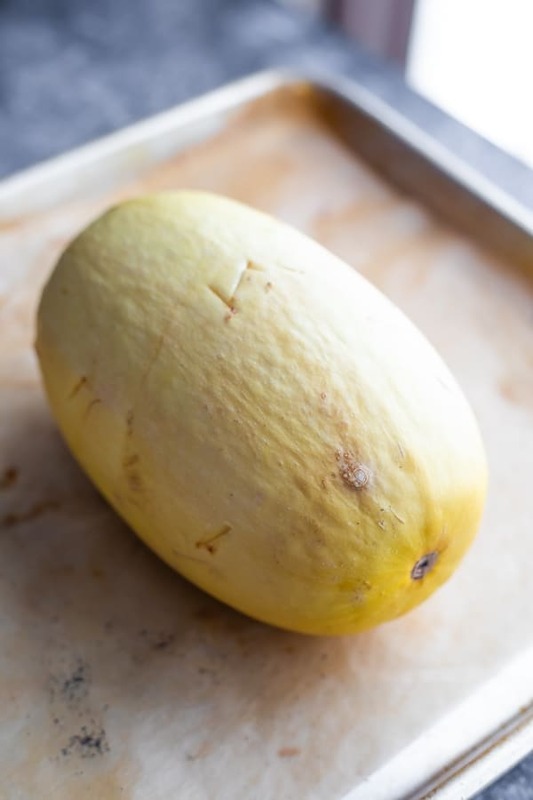 Once cooked, spaghetti squash can keep in the fridge for up to 4 days. 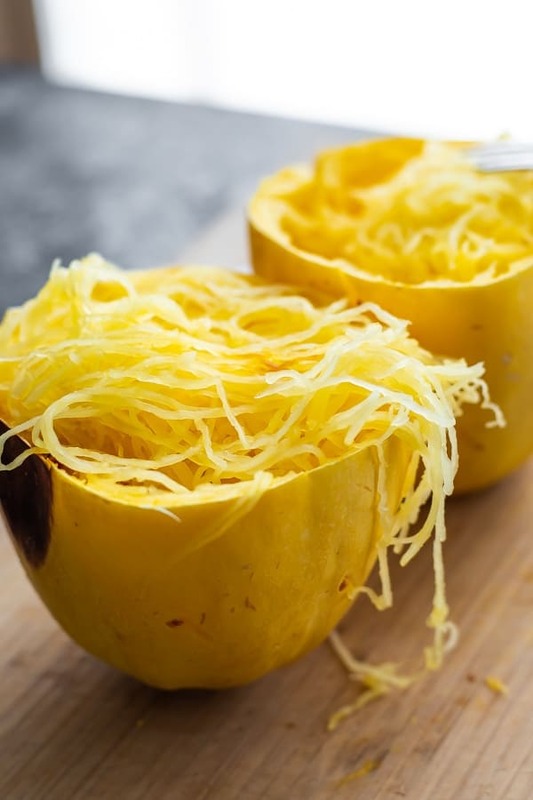 If you are adding a sauce, it can make the spaghetti squash noodles watery, which reduces their lifespan. I recommend keeping sauce & noodles separate until you are ready to serve. 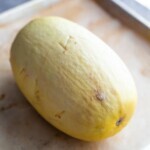 What are some ways to serve cooked spaghetti squash? I have a few recipes on the blog, and it’s definitely an ingredient I plan to use in more recipes! Stay tuned as I update this section. Heat oven to 350°F. Place spaghetti squash on a baking sheet and poke with a paring knife. 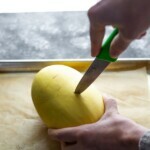 Roast spaghetti squash whole until a paring knife sinks in easily. Around 60 minutes for a 2 lb squash and 90 minutes for a 3 lb squash. Cool for 15 minutes, then slice squash in half across the middle. 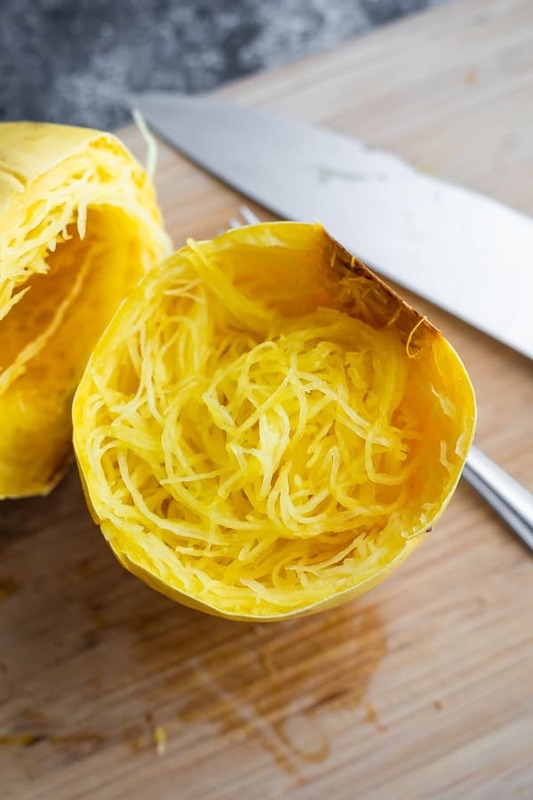 Carefully scoop seeds out (you may want to let the squash cool further before doing so), then use a fork to gently pull the noodles from around the spaghetti squash. Enjoy immediately, or store in an air tight container in the fridge for up to 4 days. Love the tip about cutting it across instead of horizontal! I also like to cook spaghetti squash whole but if you cut it, it reduces the cooking time so much that it is worth the hassle. But if I have an hour or more, I prefer cooking it whole for sure.